Last year I got talking to a man at Three Sisters, he said to me do you know the name of that rock, I said no I dont know its name. He said it called Rock Hudson, I got on my bike and rode off. That's a lovely shot Judith. Lovely sharp photo. Very interesting., and a witty caption too! Lovely photo Judith, well done, and a witty caption too! Nice one, trusting you had an enjoyable day there. Lately Black Headed Gulls have become a common sight on the Tesco car park and around Greenhough Street swooping down and picking up scraps, doesn't take them long to find that a lot more food is being discarded around there by folks visiting the recently opened McDonalds on Morris Street. 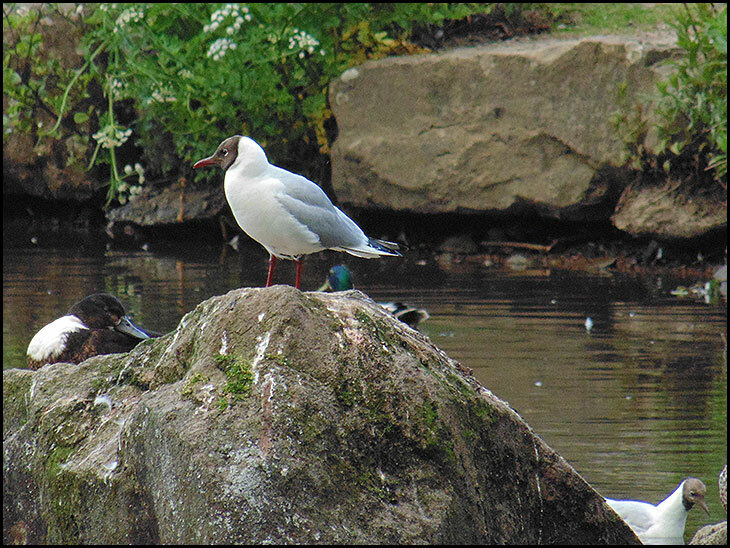 There are a lot of black headed gulls beside the lake in Astley Park, Chorley. Well taken Judith. The nickname for these gulls are flying rats, but the worst ones for greed are the larger Herein Gulls, they will eat almost anything. Mick, when you rode off into the sunset, did you part with any choice words?? I think you'll find that it's Herring Gulls - because their main source of food is, believe it or not, herrings. Well done Judith , You can give your Dad a run for his money in the photographic field !